The Natural Kansas website is your guide to the prime wildlife viewing sites in Kansas. 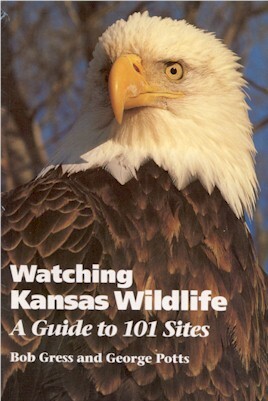 The text on these web pages is drawn from the 1993 book Watching Kansas Wildlife, by Bob Gress and George Potts, and is used here by permission. Some revisions have been made to reflect changes since the book was originally published and to adapt it for the web. You can obtain a copy through your local book store or through the University Press of Kansas. Over 100 sites are described. Have you been to them all? The sites are organized into six geographic regions. From the loess hills of the Glaciated Region to the varied landscapes of the Osage Cuestas, this area of the state has outstanding diversity. Encompassing parts of the Flint Hills and the Smoky Hills, the scenery is very dynamic here! The High Plains at its finest! Climb Mount Sunflower, visit Castle Rock and Monument Rocks or take a drive along the Arikaree Breaks. Coronado came here in 1541 searching for the fabled city of Quivira. Pioneers crossed through in the mid-1800's on the Santa Fe Trail. Make your own exploration of the Red Hills, High Plains and Arkansas River Lowlands! Home to Cheyenne Bottoms, the Great Plains Nature Center and the wide open vistas of the southern Flint Hills. A bit of the Ozark Plateau and the Chautauqua Hills and a lot of other wonderful places, too! Only the best! For the traveler on a short schedule, these places are not to be missed! The most interesting wildlife species of Kansas and where to find them! The largest expanse of tallgrass prairie left in the world is in eastern Kansas! Click the icon to learn more about this beautiful region and the many different wildlife viewing sites within it. Learn from the experts! Find out how to get the most out of your visit. Wildflower hikes, birding trips, paddling excursions and more! Highway-based Wildlife Trails are in the works for Kansas! These will be routes, utilizing public roads, which offer a framework for people to see the best the region has to offer for viewing wildlife. The Western Kansas Rural Economic Development Alliance is leading an effort to form two highway-based wildlife trails in Western Kansas. Audubon of Kansas has completed a brochure with website support for "Tallgrass Prairie Parkway" Wildlife and Natural Heritage Trail in eastern Kansas. For a copy or for more information, contact Ron Klataske at aok@audubonofkansas.org or (785)537-4385.